Tracing the Beam family’s influence on American whiskey-making is a bit like those sections of the bible that ramble on for pages telling you that so-and-so begat so-and-so, and so-and-so begat so-and-so, and so-and-so begat so-and so, ad nauseam until you just want to hit King James or Gideon or whomever in the head with a burning bush. Luckily, the Beam family’s influence on American whisky making is much more interesting than Abraham’s influence on the Israelites, and no one in their right mind would want to hit a whisky maker in the head with anything. Also, just to point out another difference between Abraham and Johannes Jacob Boehm – the patriarch of this important whiskey family, I’m pretty sure Josef didn’t drag his son up some mountain intending to sacrifice him just to get in good with his creator and receive more offspring and prosperity…although there certainly were a lot of offspring. I digress. Needless to say, the Beam family was there at the beginning of American whiskey-making, and the Beam family continues to play a strong role even today. By 1795, Johannes Jacob Boehm, a son of German immigrants, had moved his family from Pennsylvania to Kentucky and was fed up with all the English speakers mispronouncing his name, therefore changing it to Jacob Beam to make life a little easier. He was a miller by trade, and in those days, milling went hand in hand with distilling and ol’ Jake was apparently pretty good at both. His wife, Mary, was apparently pretty good at having babies, 12 of ’em in fact, one of which, David, worked alongside his father making and selling their family hooch. David, like his father, also found a woman of no uncertain uterine strength and himself sired 11 children, with three of these, Joseph B., David M., and Jack, following the families whiskey-making tradition. Joseph B. Beam lived to be 91 years old, which is a startlingly ripe old age for someone born in 1825. He, like his father and his father’s father, married a woman who cranked out the kids just about as fast as ol’ Joe could crank out the whisky – she had 14 children. It’s tempting to go back in time and implore these Beam boys to think of their wives and give these poor women a break, but such were the times. Families created their own workforces, and since this particular family’s workforce excelled at making whisky, we should all be thankful for these strong, incredibly patient, and no doubt exhausted Beam women. In fact, shouldn’t there be some sort of national holiday celebrating their fortitude and child-bearing prowess? Sure, I know we have Mother’s Day, but mothers of more than, I don’t know, six kids, should be given at least one day a year when they completely escape their kids (and all related paraphernalia) and just sit outside drinking whisky all day in the sun. Once again, I digress…back to Joseph B. Beam. Two of his 14 children, (FOURTEEN…I mean, seriously, can you imagine? I can barely wrap my head around having the two I have. Ok, sorry.) two of his children, Minor Case Beam and Joseph L. kept the family whisky-making tradition alive. Minor Case, along with having a wonderfully odd name, also had a son who went into the biz, and Joseph L. actually had seven sons who decided on a life of distilling and played a large role in American whisky’s history. Alright…I’ve over-reached. At this point, we’re only up to about 1910 in the family history and there are still about 14,789 Beams I haven’t even mentioned. Perhaps the 20th century Beams can wait for another review, it’s high time I got around to some of the booze Jim Beam is making today. While everyone and their grandma knows about the ubiquitous white label Jim Beam, Jim Beam Black flies a bit under the radar and is more or less the most “premium” bottle in the Jim Beam range. It’s been aged for eight years (compared to white label’s four) in the requisite new, charred, American oak barrels and shows up on shelves in litre bottles just as often as it does in 750’s. The Nose: A nice, straightforward, tried and true bourbon nose. Warm kettle corn, caramel, vanilla syrup, juicy oranges and black licorice candy. Lesser notes of floral, almost vegetal honey, sawn wood, and orange-infused dark chocolate trail behind. Soft, earthy spice notes of dried clove, cinnamon stick, and anise nearly obscure subtle traces of burnt popcorn and toasted coconut. The Palate: Soft creamy mouthfeel with initial notes of orange zest, burnt toffee, and popcorn that are soon joined by more caramel and vanilla. Like the nose, a faint, greenish, herbal twinge to the wood spice provides an interesting counterpoint to the early sweetness. Oak, clove, a bit of eucalyptus and mint lead to bit of corn oil and barrel char. The Finish: Nicely warming, but not very sweet. The burnt popcorn, earthy spice and barrel char from the palate linger the longest. Thoughts: Today’s Bourbon market is quickly beginning to look like yesterday’s (and today’s) Scotch market. A few hot brands and older bottlings are all the rage, and prices are going up accordingly across the board. 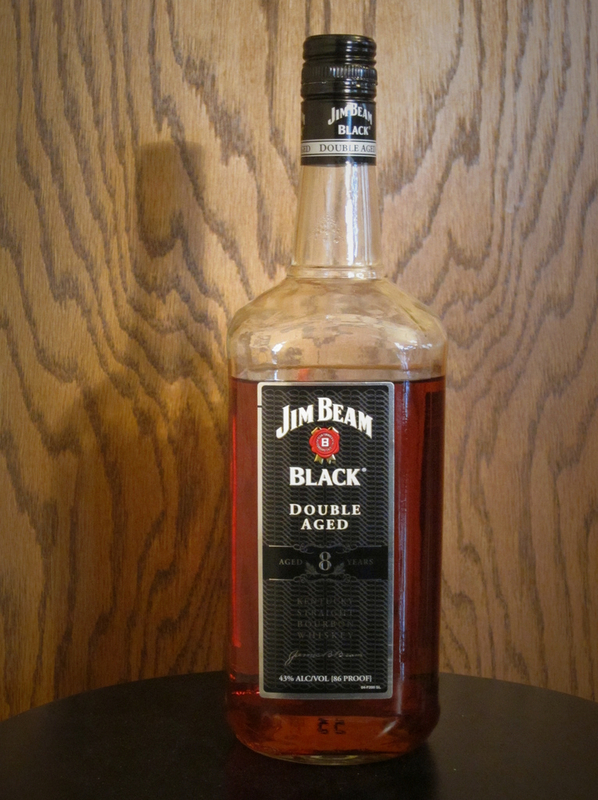 A bottle like Jim Beam Black is easy to overlook, but you’re making a mistake if you do. While it may not be the most complex, unique whisky on the market, this is nonetheless excellent, solid stuff, an everyday bourbon if there ever was one. It hits all the right “bourbon” notes while taking those slightly off-putting harsh, greenish notes of white-label beam, smoothing and maturing them and incorporating them into whiskey that’s light-years better than its ubiquitous four year old sibling. If you like a lot of rye in your bourbon, this one might not win you over, but if you like (dare I say it) pre-bourbon-hype, old school bourbon, it’s hard to go wrong here. Jim Beam Black is a versatile, have-it-neat, on-the-rocks, or in-a-cocktail, American whiskey stalwart. I picked up a litre of this for $24, which is just a terrific value. Definitely recommended. Next > Canadian Whisky, The Portable Expert – Book Review.